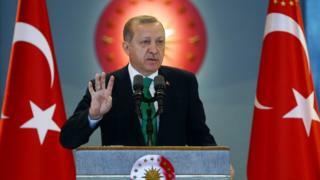 Turkish MPs are holding a second and final round of voting on constitutional changes to give President Recep Tayyip Erdogan sweeping new powers. Under the plans, the president will be able to choose ministers and judges and the prime minister post will be axed. Seven out of 18 articles were passed overnight. If MPs back the rest in the coming days, a referendum will follow. Mr Erdogan says the package will create more stable government, but critics see it as a dangerous power grab. He says the proposed changes will establish an executive presidential system like those in France and the United States. It would be Turkey's first executive presidency in its modern history. The Islamist-rooted governing AK Party (AKP) gained the three-fifths majority needed to give the package preliminary backing on Sunday, with the support of the right-wing Nationalist Movement Party, the fourth largest party in the legislature. The Republican People's Party (CHP), the biggest opposition party, opposes the changes, and debates have been heated. 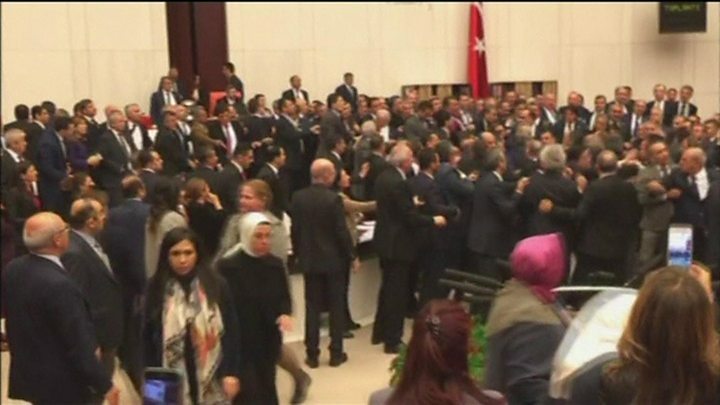 Last week a fight broke out in parliament after the AKP clashed with CHP members, when an MP tried to film a voting session during a debate. On Wednesday, US-based Human Rights Watch said the proposed changes pose a "huge threat to human rights, the rule of law, and the country's democratic future", describing them as a bid for "one-man rule". "The government is rushing the bill through parliament during a state of emergency and a crackdown in which the independent media has been silenced and public debate restricted," it added. Mr Erdogan, 62, came to power in 2002, a year after the AKP's formation. He spent 11 years as Turkey's prime minister before becoming, in 2014, the country's first directly-elected president - a supposedly ceremonial role.